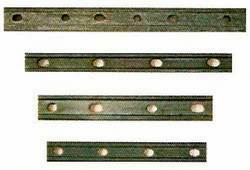 Specially forged Fish Plates for temporary repair of cracked welded rail joints with Clamp assembly to suit various rail sections are readily available. We offer combination or Joggled Fish Plate. Made of high graded raw materials, these fish plates are exclusively used as emergency repairing agents. Specially forged Fish plates for temporary repair of cracked welded rail joints with clamp assembly to suit various sections.